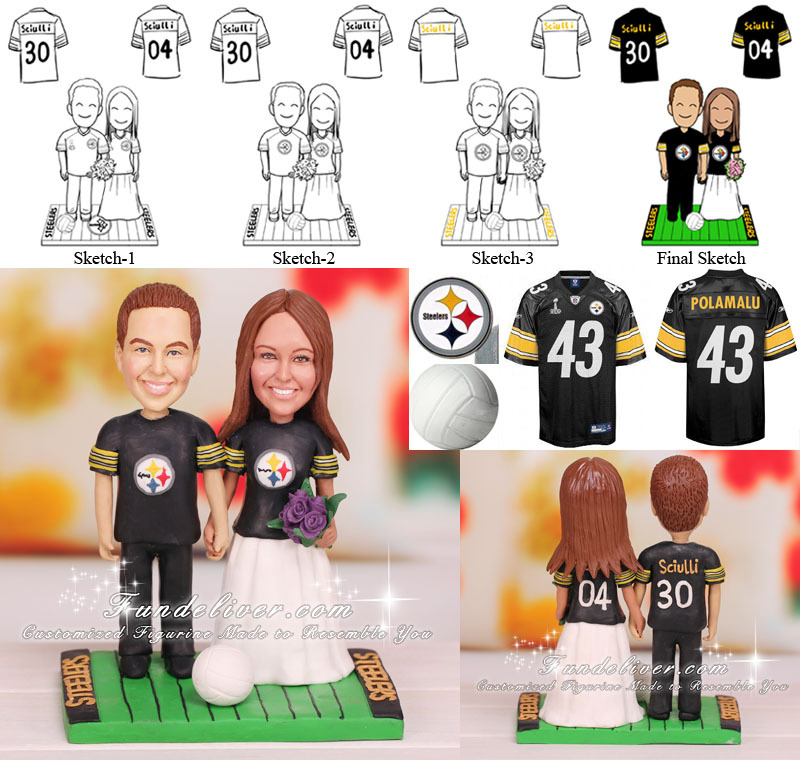 This is a completely customized NFL New Pittsburgh Steelers Football wedding cake topper ordered by one of our customers. They would like the bride and groom to be standing on the 50 yard line of a football field with "STEELERS" written in each end zone. The end zones are black and the writing they would like to be gold/yellow. At their feet they would like there to be a white volleyball. For the bride, they would like her to be in a Steeler jersey with a Steeler logo on the front, and the name "Sciulli" with number 04 on the back. For the groom, they would like him to be in a Steeler jersey also with the Steeler logo on the front and the name "Sciulli" with number 30 on the back. For the pose, they would like the couple figurine to be holding hands, smiling and bride holding a bouquet of purple roses. If you and your loved one are huge fans of Pittsburgh Steelers, why not incorporate this Pittsburgh Steelers cake topper to your wedding? 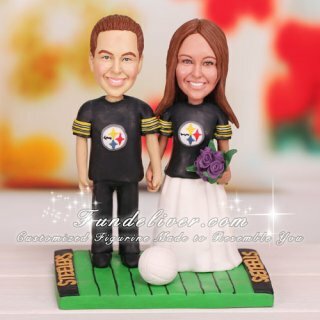 This hand sculpted New Pittsburgh Steelers bride and groom cake topper will be the talk of your party, reception or ceremony, and a great memorable keepsake. It will also look fabulous on a shelf or as a unique centerpiece, too!